Okay - if mixing is your thing and drinking a glass of white wine seems a little middle aged or girly to you, try a kir! A kir is a French drink usually served before a meal or with a snack. I find that it is excellent with brunch or a lighter meal. Ingredients: creme de cassis, white wine, lemon slice. Depending on your tastes, the ratio of cassis to wine is 1/5 if you like it sweet all the way to 1/10 if you don't. I like it with an ice cube and a squeeze of lemon. The Breakfast Club puts a couple of drops of brandy in theirs. Chill an old fashioned glass by packing it with ice. In a second glass, muddle the sugar cube and the bitters together. (Or mix the bitters with the simple syrup). Add the rye. Pour the rye/sugar/bitters mixture into the coated glass and garnish with a lemon peel. Just like Mamie used to make! What? You didn't go anywhere? Oh right. That was me. I was on vacation. But I gave you quite a lot to drink before I left, I'm SURE. And if you didn't have enough, you could always turn to beer to get you through the hottest summer month! I wasn't idle though on vacation. I did my own share of adventurous drinking. It was mostly wine, but I did recently try and compare a Doubonet Rouge from France, a Pimm's from Great Britain and a Cocchi Americano from Italy. 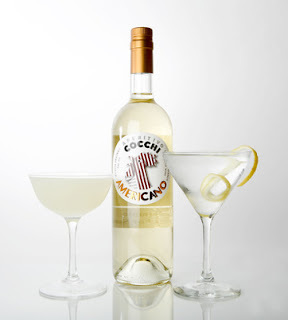 The Cocchi Americano has been around since the late nineteenth century and is used as an apertif. Serving an apertif is quite fashionable (if you're in Europe in the late 1800's and can afford to). I think though, that nobody these days would turn one down if you were to serve one. The idea of an apertif is one of appetite stimulation - something Americans could use more of. ?! Think of it as pre-gaming. A nice apertif is the Cocchi Americano from Italy. It is said to be closest in recipe and used to substitute for French Lillet (think James Bond and Hannibal Lecter), a more ubiquitous apertif-type wine with quinine in it (until 1986 apparently). Taste: Syruppy at first. Light to medium bodied, so not as heavy as you might think. Sweet for a moment like sherry, and then herbal and slightly bitter at the last. Finish: The finish is lasting, but not pungent or stinging like you might expect from something herbal. I drank my Cocchi neat with a soda and orange slice on the side. And I'm going to go back for more. Link to a Recipe for a Corpse Reviver, which includes gin, cocchi, absinthe and cointreau. Let me know if you try it! So apparently before Prohibition, gin was a low-brow desperate kind of an alcohol. Because of its ready availability during Prohibition though (it was easy to take any sort of industrial alcohol, add some juniper and glycerine, water it down and pretend it was a good label) gin became a favored drink among the higher class as well. Let me introduce you to Oxley, Hendrick's, Nolet's and Bombay (the control). 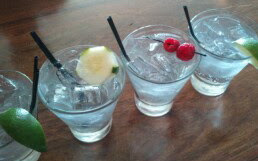 The tasting was done in the following order: Bombay - Oxley - Hendrick's - Nolet's. Bombay Sapphire is a vapor-infused gin based on a recipe from 1761 which was secret then - but whose components are labeled on every bottle and on their website and include lavender and orange, coriander, almonds, licorice and others. I find it slightly sweet, very smooth and citrusy. This is my first choice for martinis. I'd say it is the sorbet of gins. Oxley is a cold-distilled English gin with the flavors of lemon and anise and a mystery 14 other botanicals. It is not as smooth as Bombay, but definitely one of my favorites. A bit drier with a biting aftertaste that you might enjoy if you're a martini drinker. This is definitely the dark chocolate of the the gins. Hendrick's, is a small-batch gin that has been around since 1999 (just younger than most of you!) made with rose petals, cucumber and other botanicals. I find Hendrick's to be herbal and grassy - like tea. Not as fresh; not as sharp. A Hendrick's martini is fantastic if you're in the mood - they're slightly different than any other. Here we have the rainbow sherbet of the gins. Nolet's, is a Holland gin with rose, white peach, and raspberry. The company has been around for a long time, but Nolet's silver, which is what you're likely to try is a recrafted version supposedly made for modern tastes. (Nolet's Reserve is made with saffron and verbena.) The Nolet's has to go last in any tasting and is particularly suited to a gin and tonic because it has a strong enough flavor to withstand the melting of ice (which is bound to happen a little if you're faced with four gin and tonics to drink at once!). It is perfumey and floral and almost like a flavored vodka - just with that distinctive gin taste to it. This is your white chocolate strawberry mousse of gins. This was a wonderfully fun tasting to do. Garnish the Hendrick's with a cucumber and the Nolet's with raspberries and you'll have a pretty picture to go with the flavors. If you're doing this on your own, I suggest checking out those marketing websites I've included. They're rather entertaining, though the Bombay website might be frustrating if you're already a little zozzled. Do you like that gin? Are you ready to really dive in to the different ways gin can be used? Tonight I made a drink called The Everest, which was sweet, spicy, rich and delicious with my curry quinoa burgers. Mix the coconut milk and the curry powder together to make a paste. Add ice, curry coconut paste, gin, and lemon juice to the shaker. Shake thoroughly. Strain into a martini glass and garnish with cilantro and a dash of curry powder. Drink cold. For more cooking with gin (and I mean actual COOKING), check out these recipes for beef martinis and olive chicken martinis.